The Sámi are an indigenous Scandinavian ethnic group in Sweden, Norway, Finland, and the Kola Peninsula of northwest Russia who for many years were known mostly as "Laplanders" or "Lapps," terms many of them consider derogatory. 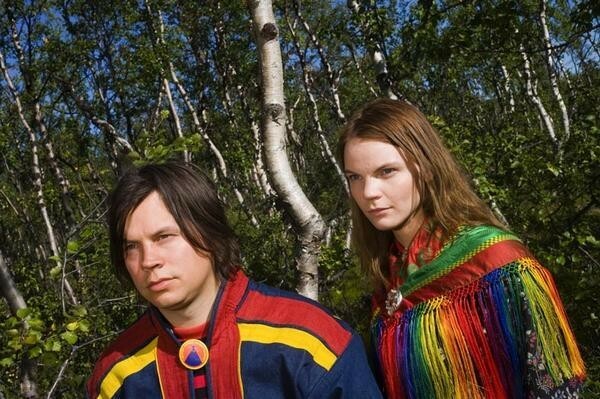 According to The Rough Guide to World Music there are between 50,000 and 75,000 people in those areas who identify as Sámi "in terms of heredity, lifestyle, or language." Musically, the Sámi are responsible for an arresting and distinctive vocal tradition known as joik, a largely improvised style rich in nonverbal elements and abstract phrases. Most traditional joik is used to embody a specific person as a kind of memorial—whether the subject is dead or alive. A wide range of Sámi musicians have transplanted joik's techniques into a broader context, like Norway's popular Mari Boine, whose tunes tend to have rock, jazz, or experimental settings, and Finnish singer Wimme Saari, who delivers a riveting, often avant-garde take on the tradition, particularly solo. Last year I stumbled upon a terrific album called Mánu Rávdnji (Trust Me) by Norway's Adjágas, whose two singers, Sara Marielle Gaup and Lawra Somby, situate joik-style vocals within catchy, elegant indie-rock tunes. Somby uses a rather guttural, consonant attack, while Gaup's lovely voice is gentle and almost gauzy; together they create beautiful harmonies, and their alternating leads give the album an impressive depth. The vocals alone would distinguish Adjágas from your average folk-leaning rock band, but the band does more than simply crown familiar tunes with quirky singing. The songs are well constructed, compact, and memorable, and the arrangements employ horns, keyboards, and a slew of stringed instruments (guitar, cello, banjo, zither, mandolin) to create a rich variety of tone colors. Multi-instrumentalist Andreas Mjøs, who was recently in town as a member of Jaga Jazzist, is part of the core group, and pianist Morten Qvenild (In the Country, Susanna & the Magical Orchestra) makes a few cameos. A couple of days ago I was surprised to learn that the group is finishing up an American tour, and tonight they perform at the Empty Bottle, opening up for Sam Prekop and Archer Prewitt. The lineup is different from the band on the album, with only guitarist Espen Jakobsen still in tow; the other touring musicians are bassist Kjetil Dalland (who's also worked with Boine), drummer Aleksander Kostopoulos, and Chicago's own Max Crawford, who says he's "faking the banjo, and playing trumpet through effects a la Jon Hassell." If joik sounds like anything else, it's the ritual music of native Americans, so it didn't surprise me when Crawford mentioned in an e-mail that the band has been "visiting reservations along the way, and played a couple of gigs with Blackfire, the Navajo punk band from Flagstaff. We met with the president of the Navajos and they serenaded him with a traditional a capella joik." Below you can hear one of the album's most beautiful tracks.